You’re probably aware of the effect gluten has on our bodies and might have read the phrase ‘leaky gut’ and wondered what it is? Leaky gut is the slang term for ‘intestinal hyperpermeability’. This literally means that there are holes in your intestinal lining that allow anything to pass through it. The intestinal tract is usually lined with ‘tight junctions’, acting as a gate which opens and closes to allow nutrients to pass through the gut while maintaining a barrier to stop harmful substances leaving the intestine into the body. However, many of us are exposed to antibiotics, preservatives, gluten, toxins and an abundance of other food additives which eventually lead to a breakdown in your intestinal lining, leaving holes in it. 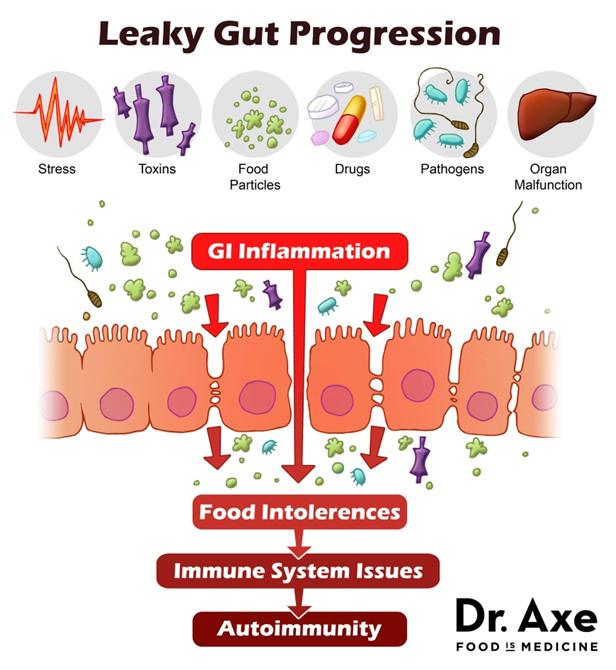 Leaky gut should be looked at seriously because if left untreated, it can lead to autoimmune diseases, skin rashes, allergies and digestive problems amongst other issues. 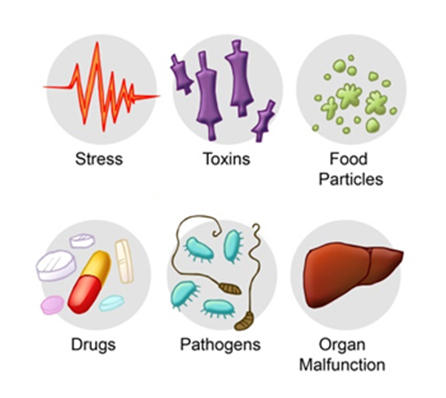 This is because items such as food proteins, herbicides, pesticides, genetically modified foods and medications move from our intestines into our blood, resulting in an immune system response as those substances are not meant to be there. Inflammation occurs as the body perceives these substances as a threat and goes under attack. Inflammation is at the basis of most modern diseases and general symptoms today, including thyroid problems, arthritis, multiple sclerosis, Crohn’s disease, weight gain, a foggy mind, headaches, sinus, joint pain and many more. Cut out gluten, as it directly causes a leaky gut. When gliadin(1), a protein found in wheat, enters your digestive tract, it signals zonulin, a protein that modulates the permeability of the tight junctions between the cells of the digestive tract, to open up the tight junctions. Treat any microbial infections such as parasites, fungus or bacteria. You can do this by getting a comprehensive digestive stool analysis through a holistic practitioner. We recommend you consider a herbal treatment protocol as it is gentler on your beneficial gut flora. Consume plenty of fermented foods(2) every day, such as sauerkraut, kimchi, apple cider vinegar, kefir or homemade yogurts. It is important to always start with a small amount of fermented foods and gradually build this amount up, which will allow your body to get used to these foods. Consume plenty of bone broth and gelatin. The amino acids glycine and proline are essential in rebuilding a healthy intestinal lining and are both found in gelatin, collagen and broths. Add lemon, lime and/or apple cider vinegar to your water! Those people who have a leaky gut typically have an overgrowth(3) of fungus, bacteria or a parasite. These microbes LOVE an alkaline environment; therefore we need to ensure our stomach remains highly acidic. Add it to your water throughout the day, or start with one glass in the morning and slowly increase the amount to a few throughout the day. Gradually introduce these changes into your diet and your symptoms throughout your body will gradually be reduced, resulting in a healthy gut. Remember, the time it takes to completely heal your gut is different for everyone, so be patient and remind yourself how worthwhile it is to be the best version of you. Is rye bread okay to eat and corn bread, polenta and corn flakes.